It's game time-it's New Year's Eve-it's your birthday. You're out with your friends, and the celebration gets a little too wild. When you wake up in the morning and you can't remember what happened, but your head is throbbing like a bass drum, you just had a bacchanal. The word bacchanal refers to the kind of no-holds-barred, crazy parties that the followers of the Greek god Bacchus threw. Since Bacchus is the god of wine and revelry, bacchanals tended to get a little out of hand: they were known for being drunken and promiscuous orgies. Bacchanal can also refer to a devotee or worshiper of Bacchus, or simply the attendees of these kinds of parties. Since the word is derived from the name of a god, bacchanal and its derivatives are sometimes capitalized, though rarely in modern usage. As an adjective bacchanal can describe anything as being like drunken, promiscuous revelry, a reveler or worshiper of Bacchus, or the god himself. Bacchanal is commonly used hyperbolically to describe excessive partying in general. So, if you were out having a good time, but not necessarily drunk or engaging in promiscuous activities, someone who is more modest might consider your behavior bacchanal. Example: Always very modest, Maura viewed Penny’s party as a downright bacchanal. 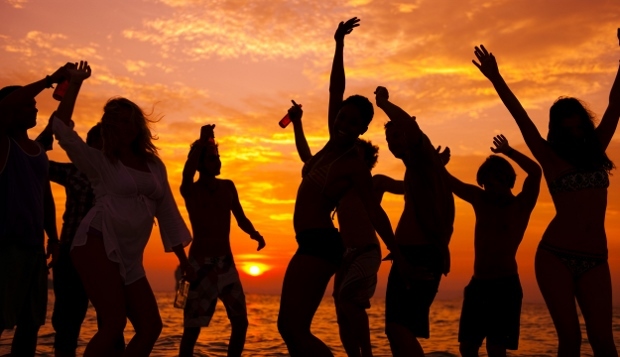 Example: For most students spring break is a bacchanal expression of relief. Example: Being religiously devoted to Bacchus doesn’t keep a bacchanal from having a good time. Bacchanal first appeared in English in the mid-16th century, first as a noun, then as an adjective. It comes from the Latin bacchanalis, which means "of or pertaining to Bacchus," who is the Greek god of wine and revelry. Bacchic: Bacchic is similar to bacchanal, except that it is strictly an adjective. So, Bacchic only describes things as being like or pertaining to the god Bacchus or festivities held in his honor. Example: The sommelier treats wine with a Bacchic reverence. Bacchanalian: This term is synonymous with bacchanal, it simply arose about a century later in the English language. Like bacchanal, bacchanalian can be used as a noun or an adjective, though it is most commonly an adjective. Example: After finals, the college students partied with bacchanalian abandon. Bacchanalia: Like Bacchic, bacchanalia is similar to bacchanal except that it is only a noun. So, bacchanalia refers to drunken and promiscuous revelry, or a patron of such a party. Example: You might never see a priest at a frat party because they don’t partake in such bacchanalia. Saturnalia: Almost synonymous with bacchanal, a Saturnalia is simply in honor of the Roman fertility god, Saturn. "How are you, my Bacchanal?" "I am very well," said [Daisy]; "and not at all Bacchanalian to-night, though I confess to another party of three." Here, Steerforth calls Daisy a bacchanal to suggest that she is a drunken reveler. Daisy responds with the form bacchanalian in the sense of "like a drunken reveler." In these poetic lines Lord Byron plays on the multiple meanings of bacchanal to suggest that the grapes are acting like drunken revelers, while simultaneously giving homage to the wine god, Bacchus. In a bacchanal you abandon all your inhibitions. Bring out the linguist in you! What is your own interpretation of bacchanal. Did you use bacchanal in a game? Provide an example sentence or a literary quote.